Explaining coexistence in species-rich communities of primary producers remains a challenge for ecologists because of their likely competition for shared resources. Following Hutchinson’s seminal suggestion, many theoreticians have tried to create diversity through a fluctuating environment, which impairs or slows down competitive exclusion. However, fluctuating environment models often only produce a dozen of coexisting species at best. Here, we investigate how to create richer communities in fluctuating environments, using an empirically parameterized model. 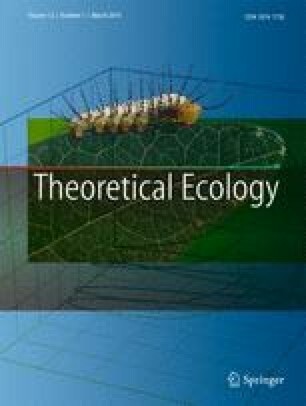 Building on the forced Lotka-Volterra model of Scranton and Vasseur (Theor Ecol 9(3):353–363, 2016), inspired by phytoplankton communities, we have investigated the effect of two coexistence mechanisms, namely the storage effect and higher intra- than interspecific competition strengths (i.e., strong self-regulation). We tuned the intra/inter-competition ratio based on empirical analyses, in which self-regulation dominates interspecific interactions. Although a strong self-regulation maintained more species (50%) than the storage effect (25%), we show that none of the two coexistence mechanisms considered could ensure the coexistence of all species alone. Realistic seasonal environments only aggravated that picture, as they decreased persistence relative to a random environment. However, strong self-regulation and the storage effect combined superadditively so that all species could persist with both mechanisms at work. Our results suggest that combining different coexistence mechanisms into community models might be more fruitful than trying to find which mechanism best explains diversity. We additionally highlight that while biomass-trait distributions provide some clues regarding coexistence mechanisms, they cannot indicate unequivocally which mechanisms are at play. The online version of this article ( https://doi.org/10.1007/s12080-019-0420-9) contains supplementary material, which is available to authorized users. We thank Alix Sauve for thoughtful comments and some bibliographic references. We are very grateful to György Barabás and an anonymous referee for their constructive feedback. This study was supported by the French ANR through LabEx COTE (ANR-10-LABX-45).